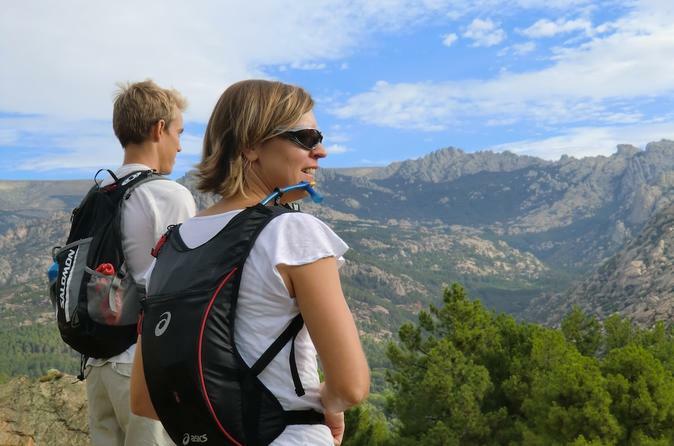 Having Madrid’s city center as our departure point, it won’t take longer than one hour to start your Hiking Day Trip in Madrid’s Guadarrama mountains. Transport is not included in the Small Group Tour's price. However, it's possible to include it once you've booked the hike. You can basically personalize the departure time within certain limits. You’ll be amazed at what awaits you this close to the buzzing capital of Spain. During this Small Group Tour (3-15 pax) you'll discover the incredible National Park right outside Madrid. Hiking over the beautiful mountain paths for about 3-4 hours will be the highlight of your trip. It's a relaxing and accessible activity, suitable for the whole family as well as groups of friends or colleagues looking for something different and refreshing to do. Your guide is always a certified mountain leader with years of experience and good English. A half day activity in the incredible Guadarrama National Park is guaranteed to be the highlight of your visit to Madrid! You can combine this active experience in the mountains with a visit to the 2.000 years old Roman city of Segovia, filled with historical marvels and culinary surprises. You’ll always be able to book the perfect Hiking Day Trip for you. The activity is accessible to all levels of experience. Madrid’s closeby forests and mountains offer a huge variety of landscapes and trails for everyone. You can be picked up at your accommodation and then drive straight to the mountains. Once there, you will hike into the mountains and enjoy some of the most unique landscapes in Europe. It's recommended you bring: Cap, Food (energy bar, banana, nuts), Sunglasses, Sunscreen Lotion, Hiking Shoes, Water/Drinks, Wind Proof Jacket. No previous experience with hiking is required. However, hikers should be in sufficient physical conditions for an activity of these characteristics. Joining is at own risk. You will not regret combining your city trip with an unexpected visit to some breathtaking natural sceneries.